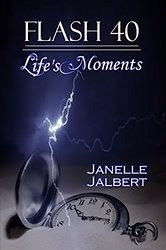 Flash 40: Life’s Moments, by Janelle Jalbert, seems to revolve around the theme that life is comprised of beginnings, middles, and endings. If you separate these types of events, you get snapshots of life -- little stories that provide for the most entertaining of reads. There are a multitude of short stories in this book, which keep the reader interested because each story is compressed. There aren't "boring" parts in any of these stories, simply because there is no time for them! The stories vary greatly due to the different characters and plotlines found in each one. Some are about parents; others are about teenagers, kids, or adults living on their own. The stories are in third person with the narrator carefully recounting each unique story. Life, death, love, loss, are all themes that can be found in this book. Some of my favorite stories are “Gone”, “Means”, and “Lightening Fast”. “Gone” is about a woman losing her high school sweetheart and love of her life to cancer. It showcases an important side of life: death, and what it means to those who are left behind to continue living. “Means” lends insight into the stressful life of being a teacher and the lack of appreciation and understanding from both the students and the principal-and how it can take a toll on everyone involved. “Lightning Fast” is about a talented basketball player with a bright future that is crushed once he becomes paralyzed during a fall. He reinvents himself with the help of a mentor and ends up turning his life around to fulfill goals he thought he could never achieve. One of my favorite things about these stories isthat the author did not try to make every one end nicely. Some endings were abrupt, others were sad, and some just left you wondering what would happen next. In this way, a sense of realism was incorporated into the work. I believe the author did this to reflect how life truly is: unpredictable and flawed. If you're into short stories, then Flash 40 is an absolute must-read!